AllSides Media Bias Ratings are fluid and subject to change as media outlets evolve over time or we acquire new information. This is why the AllSides team recently decided to review a number of media outlets in our quest to provide unbiased news. We determined the following media bias ratings had shifted from their previous positions: New York Times Editorial Board, Vox, Wall Street Journal Opinion, Time Magazine, Washington Examiner, and Associated Press. For each of these media outlets, AllSides conducted an editorial review — a key media bias rating methodology. It means the AllSides editorial staff has reviewed the works of this source and come to a consensus on its media bias. Our editorial reviews are always conducted by a variety of individuals who have biases ranging from Left to Right. 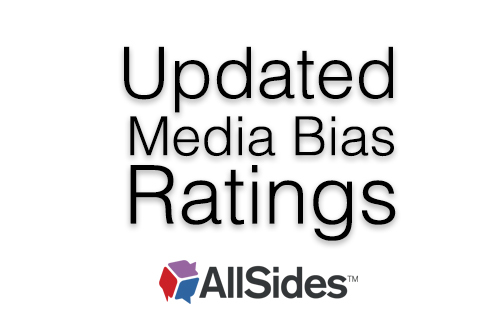 Learn more about AllSides media bias rating methods. AllSides rates New York Times Opinion media bias (which includes the Editorial Board) as Left. Our media bias rating for The New York Times Opinion page includes the various op-ed writers featured there and the newspaper's Editorial Board. During our editorial review of the New York Times Editorial Board media bias, AllSides found the board to be consistently Left. The team could not find even one example of an editorial piece with a Center or Right perspective. Every headline was Left in position, headline, and choice of topic. AllSides rates Vox media bias as Left. AllSides previously rated Vox as Lean Left. During our editorial review, the AllSides team found that Vox consistently writes favorably about Left-leaning policies and never includes a Right-leaning perspective. Articles on Vox.com have tied President Trump to fascism, and its "Explainers" section rarely includes Right-leaning opinions or viewpoints. Vox's Explainers only provide one side of an issue, making it seem as if that's all readers need to know, when in reality, Right-leaning individuals might include other facts or make different points about the topic. This prevents readers from getting a holistic understanding of the issues highlighted. AllSides noted that Vox often frames news and issues as if the Left perspective is the only perspective, and its "news" articles include commentary that is subjective in nature. One AllSides team member noted Vox "seems like advocacy outlet for the Democratic Party, showing all the "news" you'd like to hear as a Democrat." AllSides rates Wall Street Journal Opinion media bias as Lean Right. AllSides previously rated WSJ Opinion as Right. AllSides found that WSJ Opinion does not outright ignore Left voices and perspectives, as many extremely biased outlets do. In fact, WSJ highlights them frequently — if only to combat them. When it comes to economics, WSJ Opinion writers are clearly far Right. However, they take a traditionally Left view on some other issues, such as civil asset forfeiture, redistricting and more. One AllSides team member referred to WSJ Opinion as "Rockefeller Republicans — more moderate and even-handed, not supporting Trump consistently." AllSides noted WSJ Opinion writers are comfortable with delineating from the dominant Republican view on any given issue, refusing to parrot popular talking points. The writers frequently buck groupthink and truly think for themselves. WSJ Opinion is Lean Right biased, but independent in thought. AllSides rates Time magazine media bias as Lean Left. AllSides previously rated Time magazine as Left. During the Sept. 2018 editorial review, the AllSides team noted that Time magazine's news pieces are written in a narrative-based way: rather than simply stating hard facts, Time often paints a picture in its writing. Time magazine occassionally includes some Center perspectives. During our review, we saw a number of "puff pieces" favorable to Democrats featured prominently on the site's main pages. The AllSides team noted Time is not as sensationalist and does not employ as much emotional language as other far Left outlets, though it still does employ these tactics from time to time. AllSides rates Washington Examiner media bias as Lean Right. AllSides previously rated Washington Examiner bias as Right. During the editorial review, our team noted that the Washington Examiner's bias is reflected in the fact that its story choice is conservative, but the stories are not presented in a way that is as sensationalist or exaggerated as is seen in many far Right media outlets. The Washington Examiner often does showcase Democratic or Left-leaning points of view, even giving them a place as a top headline, and covers different sides of various issues. AllSides rates Associated Press media bias as Center. In general, AP portrays all sides equally, uses objective language, and refrains from sensationalism, emotional language, and hyperbole in its headlines and coverage. However, in the months leading up to Sept. 2018, AllSides received messages from readers concerned that AP's media bias had shifted Left after President Trump's election. AllSides conducted an editorial review during the last week of Sept. 2018, in which news about Brett Kavanaugh's Supreme Court nomination was dominating the news cycle. This impacted our ability to get a comprehensive view of AP's media bias when it comes to covering a variety of issues. AllSides will continue to assess AP over time. Notably, the AllSides team agreed that AP's coverage of Kavanaugh's confirmation was Lean Left. Some on the team noted that articles such as, "Kavanaugh-Ford hearing: A dramatic lesson on gender roles" — which criticized Kavanaugh for being defiant and patted Ford on the back for being sympathetic during the hearing — was written with a Lean Left media bias. Overall, AP's coverage of the hearing focused more on Kavanaugh's defiance and proclamations that the process had been a "national disgrace," while largely ignoring how Kavanaugh spoke about the impact of the allegations and media coverage on his family. While there is some Left-Leaning content on AP's site, it is not enough for us to switch its rating from Center to Lean Left. We will continue to monitor AP's media media bias closely — particularly, when there is not one story dominating the news. Do you agree with AllSides' media bias rating of the New York Times Editorial Board, Vox, Wall Street Journal Opinion, Time Magazine, Washington Examiner, and Associcated Press? Rate the media bias of these outlets on our media bias ratings page.